In the early 1900’s it was fashionable for ladies hats and fans to be lavishly decked out with ornate bird plumage from any number of domestic or foreign species, particularly wading birds. The Roseate Spoonbill (Ajaia ajaja), along with other domestic species, such as the Snowy Egret, were nearly driven to extinction as plume hunters slaughtered the birds by the hundreds. By the 1930’s the once thriving Florida population of Roseate Spoonbills had dropped to only 30-40 breeding pairs, barely enough to sustain the species putting it at grave risk of being wiped out altogether. Fortunately, some degree of sanity came just in time to the trade as fashions changed and conservation minded people voiced their concerns. The Roseate Spoonbills were subsequently protected, as were other rare birds, and have since made a fine recovery. As you can see from the pictures, these wading birds are large with distinctive pink plumage that certainly looks better on the birds than on ladies hats. Like the American Flamingo, their pink color comes from their diet in which they injest by default the carotenoid pigment canthaxanthin among others. They stand nearly three feet tall with their necks outstretched and have a wingspan of some four feet. They inhabit marshes, swamps, ponds and riverine areas where they breed and travel in small flocks. 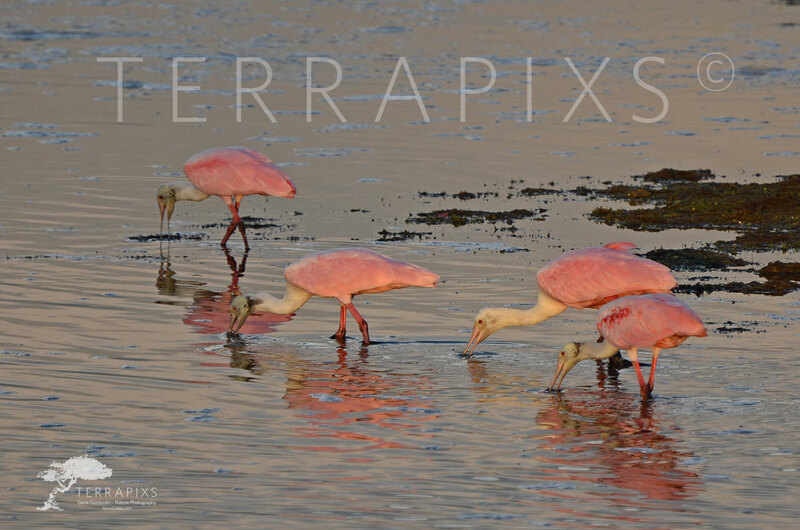 The Spoonbills in this picture are feeding in a ponded area on Sanibel Island, Florida late in the day. Their spoon shaped bills are uniquely designed to allow them to strain microscopic organisms, small fish, amphibians, and aquatic invertebrates from the sand and mud bottoms as it swings its head back and forth. Most Spoonbills do not breed until they enter their third year. When they do, the courtship displays are nothing short of spectacular, a joy to see what with all the colorful plumage. The female lays three cream colored eggs incubated for three weeks. The newly hatched chicks have to work up to the grace and beauty of the adults, provided they survive predation. So, if you are down along the southern U.S. Coast and catch a glimpse of a gorgeous pick bird chances are it is a Spoonbill. A feast for your eyes. Enjoy! Get notified of each Print of the Month and other Gene J. Gonsoulin Photography News! We respect your privacy. Email will only be used for Gene J. Gonsoulin Photography.